Figure 3-51. H-Meter calibration chart. 3. Type of aggregate and cement affects the correlation of the rebound numbers with actual compressive strength of the concrete under test. A calibration curve is required for each particular concrete mix to assure accuracy. Since this is not practical for most situations, the data should only be used for making comparative measurements from one location to another within a uniform concrete structure. Because of these limitations, the estimation of concrete compressive strength obtained with a rebound hammer is only accurate to about ±25 percent. This applies to concrete specimens cast, cured, and tested under the identical conditions as those from which the calibration curves were established. The rebound hammer is primarily useful for checking surface compressive strength or surface hardness and uniformity of concrete within a structure. It can also be used to compare one concrete structure against another if they are known to be reasonably similar. 3.6.4.3 Ultrasonic System. The ultrasonic system shown in Figure 3-52 is used to obtain a general condition rating and indication of overall strength of the concrete based on sound velocity measurements through a large volume of the structural element. It is recommended that the underwater ultrasonic system be used primarily for checking the uniformity of concrete from one test location to another in a given structure. If the data consistently indicate poor or very poor quality concrete, core samples must be taken and standard compression tests performed to confirm the results. 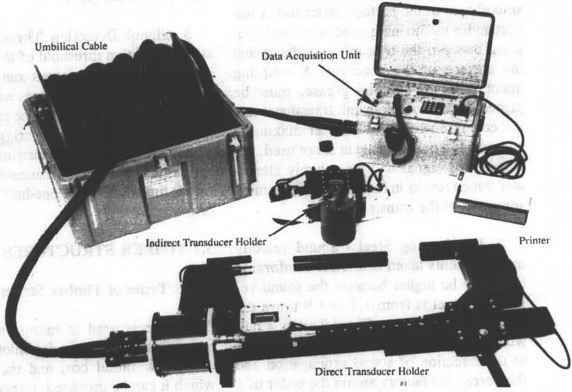 The system consists of two different underwater transducer holders for direct and indirect sound velocity measurements. An umbilical cable connects either the direct or indirect transducer holder to the topside DAU. The DAU contains most of the signal conditioning electronics and data acquisition system. Ultrasonic techniques use the transit time of high-frequency sound waves through concrete to assess its condition. Ultrasonic testing procedures for concrete have been standardized by ASTM Standard C597 and test equipment is available from commercial sources for in-air testing. Measuring sound velocity in concrete requires using a separate transmit and receive transducer to avoid energy scattering and reflection problems. Sound velocity is calculated by measuring the time required to transmit over a known path length. The average sound velocity obtained should only be used as an indicator of concrete quality and not as a measurement of compressive strength. Table 3-7 presents some suggested condition ratings for concrete based on sound velocity measurements. The two methods used to measure sound velocity in concrete are direct and indirect. The most preferred method is direct trans mission where the transducers are positioned on opposite sides of the test specimen and the waves propagate directly toward the receiver. This method provides maximum sensitivity with a well defined path length. Indirect transmission is used when only one surface of the concrete is accessible, such as a concrete retaining wall: both transducers are placed on the same side of the concrete. With this method, energy scattered by discontinuities within the concrete is detected by the receive transducer. • Transducer Holders. Two types of transducer holders are provided with the ultrasonic system. The direct transducer holder (Figure 3-53) is used to examine structures with accessible opposing surfaces; for example, concrete piles. The indirect transducer holder (Figure 3-54) is used to examine structures with only one accessible surface; for example, concrete bulkheads. The direct transducer holder framework can be adjusted to accommodate concrete pile sections that range from 8 inches to 24 inches thick. The digital display of sound wave transit time provides feedback to help the diver position the transducer holder for optimum results. The indirect transducer holder is very similar to the direct transducer holder in operation except for the path length measurement which is fixed at 12 inches. A suction cup was added to the indirect holder to force the transmit transducer firmly against the concrete surface under test and provide a reaction force for the diver. A small suction pump is used to pump water from the cup to provide a holding force of about 25 pounds depending on the surface condition of the concrete. Figure 3-52. 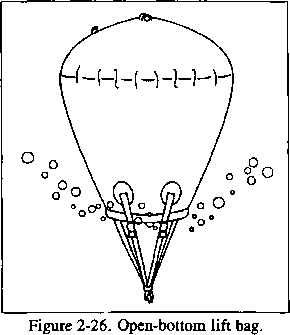 Underwater ultrasonic test system. 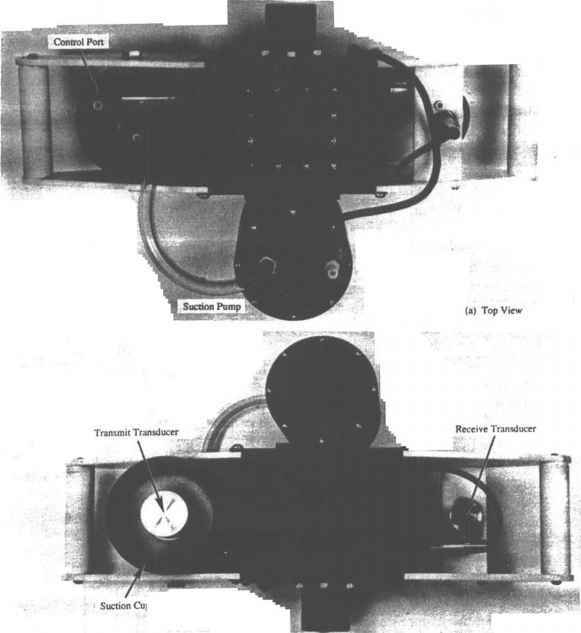 Figure 3-53 Director transducer holder. 1. Concrete Surface Finish - The smoothness of the surface under test is important for maintaining good acoustical coupling between the transmit transducer and the surface of the concrete. A coupling agent, such as silicone grease, must be placed between the transmit transducer and the concrete surface to transfer maximum energy. If a coupling agent is not used, the transmitted signal will be severely attenuated which results in large errors in the measurement of the transit time. 2. Reinforcing Steel - Sound velocity measurements taken near steel reinforcing bars may be higher because the sound velocity in steel is from 1.2 to 1.9. times the velocity in concrete. The effect is small when the axis of the rebar is perpendicular to the direction of sound propagation and the correction factors are on the order of 1 to 4 percent depending on the quality of the concrete. 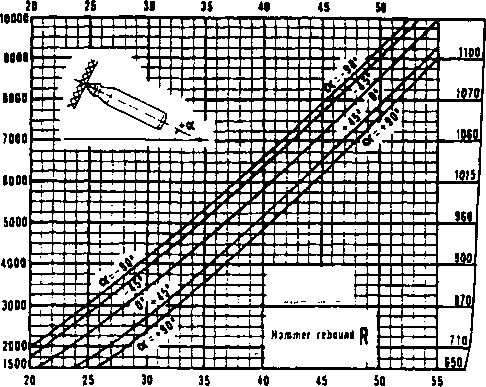 If the axes of the rebar are parallel to the direction of sound propagation, reliable corrections are difficult. Therefore, it is recommended that sound transmission paths be chosen that avoid the influence of the rebar. 3. Signal Detection Threshold - The signal detection threshold of the ultrasonic system can cause erroneous transit time data to be recorded. This happens when the amplitude of the first peak of the received signal is below the threshold triggering level of the system. When the instrument detects a following peak, this causes an apparent transit time increase of one-half wavelength or more. Figure 3-54. Indirect transducer holder. has a wide range of uses in marine construction. It can be used as pile material for waterfront structures such as piers and wharves; as decking and framing material for the upper portion of waterfront structures, fender piles, and dolphins; and as construction material for bulkheads and re taining walls. Softwood timber, such as fir and pine, must be pressure treated with an appropriate preservative before it is used in the marine environment. Hardwoods, such as oak and greenhart, which are often used in fender systems, are not treated. Timber structures are subject to deterioration from decay or rot, attack by marine borers and insects, splitting and checking brought about by drying shrinkage or by the alternate wetting and drying cycle within the splash zone, overloading, corrosion of connections, abrasion, and ice heaving. 3.7.2.1 Fungi and Rot Damage. Several species of fungi exist by feeding on timber, causing a breakdown within the cellular structure of timber under attack. In the early stages, fungi attack is evident by a discoloration and softening of the wood accompanied by a fluffy or cottony appearance. Advanced attack will cause destruction of the wood cells and the appearance of fruiting bodies, such as mushrooms. Figure 355 illustrates the effect of timber rot. The rapidity of decay is dependent upon the fungi species, variety of wood, exposure, and climate. To live, fungi must have air, food (the wood), favorable temperature, and a moisture content of over 20 percent, which is generally higher than that of typical air-dried wood. Submerged timber will not rot because ofa lack of air. Fungi growth takes place in all saltwater environments within the temperature range of 50 to 90°F. As the temperature level drops to freezing, fungi growth becomes dormant, but will reactivate when the temperature increases. 3.7.2.2 Marine Bora* and Insect Attack. Marine borer attack is a very serious problem for timber structures in the splash and submerged zones. The ravaging effects of two large groups of marine invertebrates, the Teredo (commonly called shipworms) and the Limnoria (commonly called wood-gribbles), are well-documented. Shipworms (Teredo) are mollusks and are distantly related to the oyster and the clam, even though the adult form is wormlike in appearance. Shipworm species are found in nearly all saltwater harbors and oceans of the world, except for the colder waters of the arctic and antarctic regions. Adult shipworms eject their young into the water at birth. These miniature animals are driven by tides and currents until they settle on firm surfaces or die. Should they settle on submerged timber during the first 48 hours of their life, they begin to change in physical appearance, with the body beginning to elongate, while two clam-like shells begin to auger into the wood. The original hole in the timber surface created by the infant shipworm is no larger than the diameter of a pinhead.